People in San Diego County are very familiar with this time of year as May Gray turns into June Gloom. Our mornings are damp and gray and it stays that way until sometime after lunch. While this phenomenon is always somewhat humorous in the way that it confuses tourists who assume that Southern California is clear and sunny 100 percent of the time, it’s also an important time of year for our plant life and our lawns because the moisture that’s provided can help them to survive the extremely dry portion of the year that is not very far off. Even though people may be able to use less water on their plants and their lawns during this gray and gloomy time of year, that doesn’t mean that our plants and our lawns are not at risk of facing other problems and pests. Most notably, this is the time of year when we start to see the emergence of a real enemy of these portions of our properties, and that enemy is the snail. Anyone who puts effort into their yard understands that late spring and early summer is the time when seemingly hundreds of these creatures begin to appear, and they do so because they have more time to avoid the direct sunlight. They also spend their time munching away at our plants and our lawns. Legend has it that snails only became part of our environment after a chef brought some over from France to be used as escargot. However, those snails escaped and with the lack of natural competition they soon began to thrive. To homeowners, how snails got here doesn’t matter; they just want to rid their properties of them so that their plant life is not slowly but surely eaten away as the spring turns towards summer. Generally speaking, there is no one be-all-end-all solution for eradicating snails from your yard. You’ll need to spend some time simply hunting them and picking them off of your plants and discarding them. 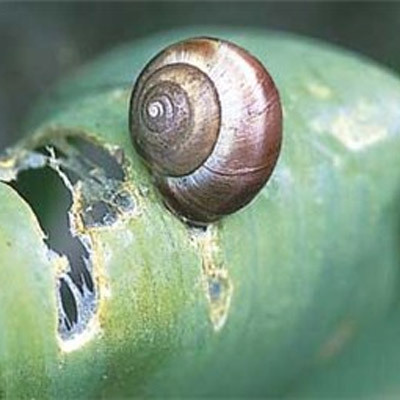 You can also take advantage of snails’ desire to avoid sunlight by placing boxes and other containers under trees, and you’ll likely be surprised to see how many are in there at the end of every day. There are also some products available that can kill off snails, but homeowners with pets should be careful about using these because they can be toxic to dogs and cats. Most people would assume that snails are relatively harmless, but those people likely have never seen the damage they can inflict on a yard. The best way to deal with this problem is to simply stay on top of it with a strategy that provides you with a system for eradicating them. If you need help with this or any other management aspect of your yard, contact the San Diego landscapers at Juniper Landscape Company today to schedule an initial meeting.